My sock looks almost the same as last time you saw it. But, surprise! I have done lots of work on it since then. Two weeks ago, mid-crisis, I went to knitting group because...how relaxing! Knitting! With lovely, inspiring people who are also knitting! 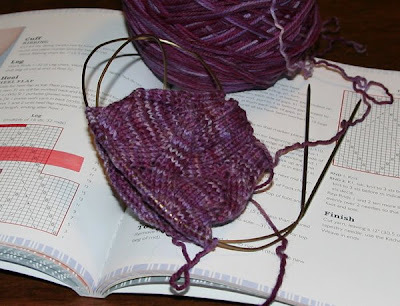 By about halfway through the evening I was getting close to the heel of my sock and realized that in my recent distraction I hadn't tried it on yet. Even once! So I pulled off my shoe and sock (and that's another thing - why am I still forced to wear socks at this point in the so-called summer?) and with a flourish, brought my sock-in-progress over my toes and proceeded to pull....and tug....and swear....and couldn't get it over my heel. So I ripped it all out, worked on my Coraline swatch, and looked at some knitting books until it was time to go home. The next day I restarted it on larger needles and have been trying it on about, oh, every ten minutes. Just to make sure. initially i thought knitting is just a wastage of time. my mind has changed. it is now a mind soothing activity for myself.